It is a sobering thought that, based on current figures, more than 1 in 10 of us will suffer from dementia during our lives. In the Civil Service, that means up to 50,000 of our colleagues across the country will develop or already have the condition. And it’s going to get worse - over the next 30 years, the number of people in the UK with Alzheimer’s and other dementia-related conditions - currently 835,000 - is expected to double. Unsurprisingly, given the scale of the problem, many of us - around 1 in 3 - have a close relative or friend with dementia and experience at first hand the impact it can have on their lives and their families. At the moment, the causes are uncertain and there is no cure. There is a role, of course, for government in doing the big things - funding and facilitating research and improving the care of those who live with dementia in the health service, which initiatives like the Prime Minister's Challenge on Dementia are addressing. But it is clear that the need to understand what dementia means for those who live with it is greater than ever. Learning how to handle and help people with these conditions - doing the little things that will make their lives easier - is something we can all get involved in. This is underlined when we learn that, according the Alzheimer’s Society, two-thirds of all people with dementia are cared for in the community. I recently became a Dementia Friend, taking the awareness session training to understand more about the condition and find out how I could help. But I am very far from the first civil servant to do this. Civil servants are some of the most enthusiastic volunteers and supporters of charities of any group in society, giving up your time for any number of good causes - a fact recognised by the new Volunteering Award at the recent Civil Service Awards. 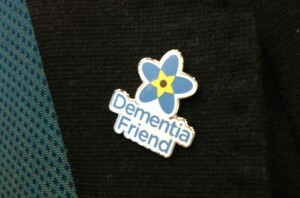 I’m proud to say that, since the initiative was launched, around 10,000 civil servants have become Dementia Friends - you may have read about the experiences of some of them in this very blog. This month, the whole Cabinet joined them as trained Dementia Friends. Becoming a Dementia Friend, you learn that the condition is not a natural part of ageing but the consequence of a disease of the brain. It is completely indiscriminate and, contrary to popular belief, doesn’t just affect the over 65s. Dementia is about losing the connections that make sense of everyday life, from forgetting the names of familiar objects and being unable to recall things you’ve heard, seen or read, to - in severe cases - the tragic loss of recognition of even those closest to you. Awareness will help us spot the signs, and then it is about showing consideration, patience and assisting in small practical ways that will make dementia sufferers lives just a bit easier. Whether that’s helping someone find what they need in a shop, volunteering your time to keep dementia sufferers physically, mentally and socially active, or as civil servants in contact with the public being confident that we can deal sensitively with people who have the condition. If you haven’t already, become a Dementia Friend. There are over 600,000 of us in the UK, with a target of 1 million by 2015. We can help those with dementia make the connections they’ve lost that enable them to function and retain their independence for as long as possible. One day we may need Dementia Friends ourselves. What are we doing to support people in the Civil Service affected by mental health problems? There are more working adults caring for someone with dementia than you might imagine. In line with Radio Devon wanting to make Devon a Dementia Friendly county, I began driving an initiative in April 2014 to make Met Office a Dementia Carer Friendly workplace, creating a new, simple model for dementia friendly organisations, as it focuses on the carers. Met Office supported me to become a Dementia Champion to give regular Dementia Friends sessions at work and in the community. I then set up a Dementia Carer Network group which meets monthly for support and information sharing and created Carer Buddies who can pair up to have a coffee and face to face chat. This initiative has had amazing positive feedback and engagement from all levels of staff and the network and carer buddies are growing month on month. I will be giving a Dementia Friends session to Met Office Exec on 17th December. I was also sponsored by Prospect to do Principles of Dementia Care Level 2 which provided me with material to inform the Dementia Carer Network group. TUC and Alzheimer's have both done case studies on my work and I have been on Radio Devon three times to tell others how Met Office is leading on this focus for carers. This is a simple model other organisations could easily follow. In my own time I am also part of the steering group which is forming to make a Dementia Action Alliance for Exeter. Its great to see how you have taken this forward in the Met Office Mary. I know from having the priviledge of sitting in several of your sessions that they are truly thought provoking. Having become a Dementia Friend myself I would recommend anybody attending a session and perhaps moving on to become a Dementia Champion. I am a trained Dementia Friends Champion and I love the simplicity of the initiative and how impactful it can be on communities. The Dementia Friends Information Sessions provide information that I wish had been available to my family and I when my Aunt had vascular dementia some years ago. Interestingly some of the sessions I've delivered of late have been in Care Homes for staff and in local health and social care teams due to an absence of dementia awareness training through other channels. I truly love delivering every session whether it is for those working with people living with dementia, for those living with and/or caring for a loved one with a dementia diagnosis or for those with no first hand experience who wish to become more aware. One of the incredible by-products of an Information Session is that is has the capacity to make all of us a little more compassionate to those around us. I work in APHA and recently asked for 5 days special leave to help look after my mother who has Alzheimer's; my request was refused as apparently I should plan my leave more carefully!! Trouble is all my leave is used up with caring responsibilities; please lets have less of these mis-leading stories about how family and carer friendly departments are.